Mommy Delicious: Big Apple Circus Presents "Dance On!" 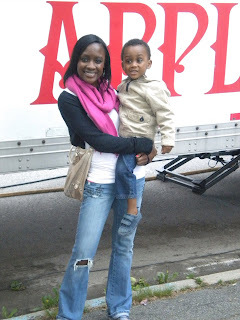 This past weekend, Aiden and I were invited to attend the opening weekend of The Big Apple Circus' Dance On! show located at Cunningham Park in Fresh Meadows Queens, NY, which will run from now through June 5th. Taking the trip out to Queens, NY was totally worth it because Aiden and I had a fabulous time. Since it takes place under the Big Top tent, no seat is located more than 50 feet from the ring and the atmosphere is intimate and interactive. The troupe of monocyclists and lasso twirlers were so much fun, the contortionists and athletes defied the laws of gravity, and the miniature horses were an added treat! Nice! I really liked that many of the performers included audience members in their acts. It was quite lovely as audience members danced, sang, and flew in the air. Literally. Both the kids and grown-ups enjoyed it, which made the energy pretty freakin' amazing. The show is only 2-hours long, which includes intermission. This is perfect for the toddler and/or preschooler who doesn't like to sit still for long periods of time. But believe me, with all the action going on under the tent, no one will actually want to sit still. And right outside of the Big Top tent is a field where the kids can run freely and make wishes with dandelions. The Big Apple Circus will take place under the Big Top tent from now until June 5th and they have generously extended a discount to Mommy Delicious readers. You can enjoy $15.00 off each ticket to Dance On! Online: Enter the code POP11 in the Promotional Codes box in the lower left of the page. By phone: Call 888-541-3750 and mention code POP11. Have a great time, Lovelies! Disclaimer: I was chosen to be a part of The Big Apple Circus Blogger Program and received complimentary tickets to Dance On! in order to write this review. All opinions expressed herein are my own. Looks like so much fun! I've never been to the circus, but it always looks like a blast! The circus is always so much fun! You guys looked like you had fabulous time! You get to do the coolest activities! teensy jealous over here! I just noticed that Aiden has your smile...sweet. Super cute pictures! It looks like you guys had a blast.. sometimes I wished I lived in NY, so much cool stuff to do Waaaaa! Glad you guys had fun. I need to take Moo to her first circus still. Looks and sounds like you had a blast! Am sure Aiden thoroughly enjoyed himself........he is too cute! I love the pic of him blowing the dandelion, just precious!